Alright folks, I have once again found a beta APK to sideload in order to give y'all the scoop of what to expect from an upcoming release. 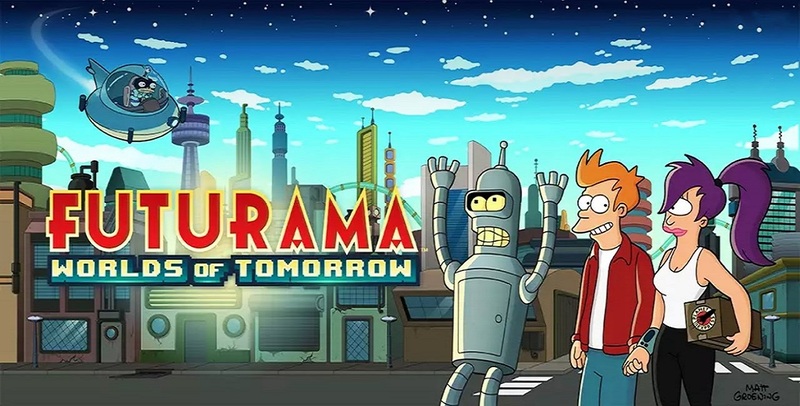 Today I am taking a look at TinyCo's Futurama Worlds of Tomorrow. From a cursory glance it is eerily similar to another one of the developer's games, Family Guy The Quest for Stuff. But the similarities do not stop there. 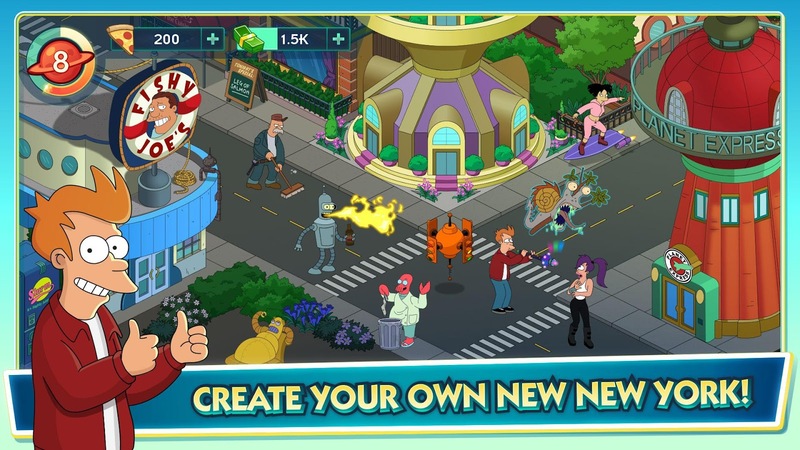 The Family Guy game is actually just a clone of Electronic Arts's The Simpsons: Tapped Out. Clones of clones, what better way to earn money than with someone else's tried and true method. Now don't get me wrong. There is obviously a draw to the type of gameplay this title offers. I mean I get it, you delve into a universe you are familiar with and find enjoyable. Not only can you build out a custom designed city, but you can also equip different outfits to each and every one of your characters. 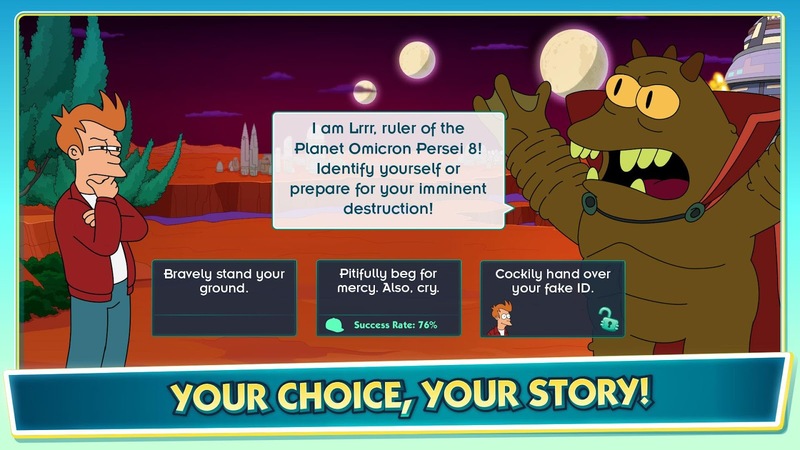 It is like your very own Futurama universe, customized exactly to your liking. I can totally see the appeal. Taking that appeal a step further, the developer has paired up with the creative team behind the original TV series. How deep this partnership goes is unknown, but the art design along with the writing feels pretty spot-on. Sadly, the voice work is lacking. It is almost as if they could not get any of the original voice artists, and so just use sound-bytes from the TV shows and movies. Even then, there are way too many instances where the game feels hollow as all you are doing is reading text. Short of this missing voice work, yeah, I think TinyCo actually nailed that certain je ne sais quoi you get from watching Futurama. 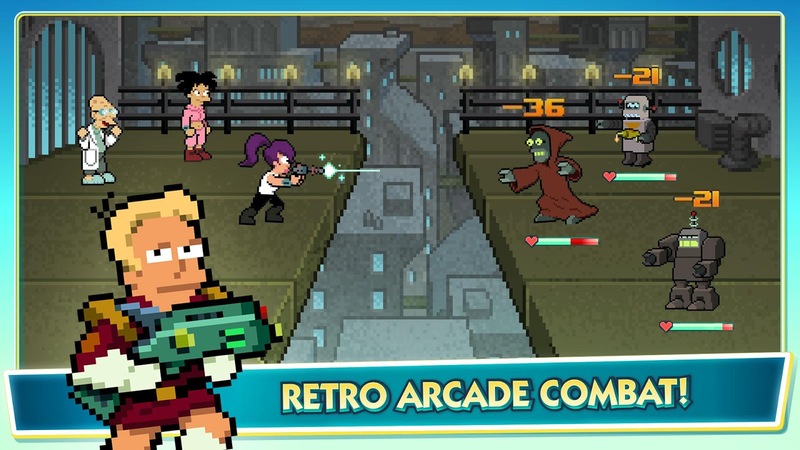 If you are unfamiliar with the gameplay found in Futurama Worlds of Tomorrow, (or the games it was cloned from) it is a mix of city building, object collection, and quest completion. There is even a mini-game where you fight adversaries while you are exploring other planets in space. Basically, you will start out unlocking districts on the map in order to add new buildings. These districts will require certain characters to be unlocked. The thing is, characters need particular items to be unlocked themselves. This is where the questing comes in. You will take the Planet Express ship out to explore other planets in search of these needed items. Now I know what you are thinking, all of this seems overly complicated. Luckily this convoluted system works pretty seamlessly as you are always guided towards the next task. The thing to remember though is that many of these actions tend to have wait timers accompanying them. Which is the crux of the matter. While the design is enjoyable and there is a lot to like about the title, it is the constant grinding, the constant false roadblocks, and the constant push to spend money on in-app purchases that make the experience pretty unbearable. More often than not, these free-to-play titles usually come down to one thing, money. The in-app purchases in Futurama: Worlds of Tomorrow, of course, run as high as $99.99 per item (if the beta release is anything to go by). You will find that there are two types of currency used in this title, Nixonbucks and Pizza. The Nixonbucks can at least be earned through gameplay, albeit at a very slow pace. The Pizza, on the other hand, seems a lot harder to obtain. It is used exclusively for the best items in the game, which means if you really want to customize your city to look unlike anyone else's, you will need to fork out a lot of cash. 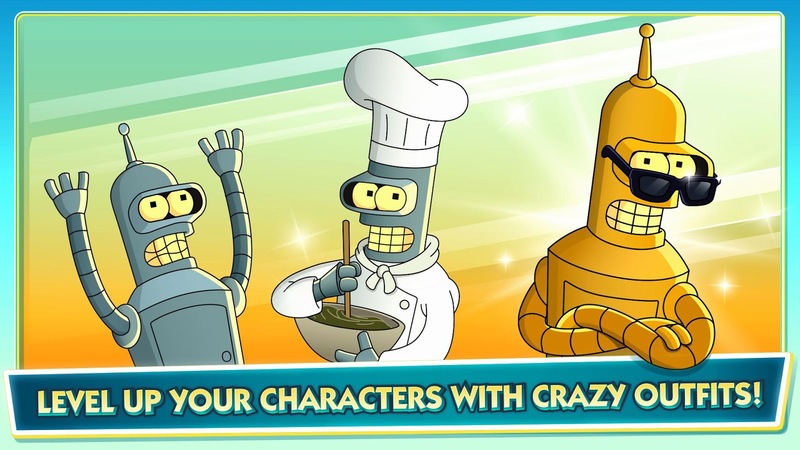 While I have a lot of love for anything Futurama, I find it difficult to enjoy a game that is so blatantly trying to annoy me into paying money. What ever happened to spending money on something because it is enjoyable? Frankly, I am sick of all of the tricks these developers use to create constant roadblocks in what could have been a pretty fun game. Tarnishing a beloved franchise with these shady tactics is just the icing on the cake I suppose. 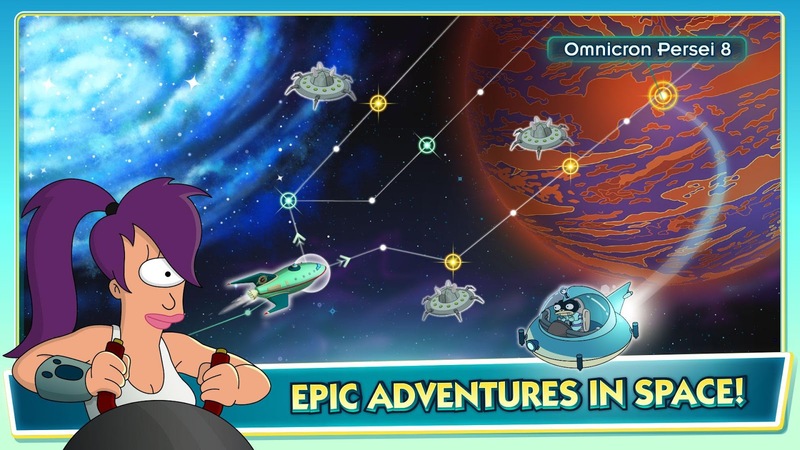 After the geo-restricted beta, Futurama Worlds of Tomorrow is now live on the Play Store for everyone. If you want to ignore all that is bad about this game and download it anyway, the link is still the same one as before.